Function:, an integrated marketing agency that specializes in connecting building product manufacturers (BPMs) to architects, contractors and facility managers, recently produced an advertisement for Kawneer Company, Inc.’s ongoing sustainability campaign that was recognized as “Best in Class” in this year’s Architectural Record Excellence in Advertising Award competition. The awards are given jointly by McGraw Hill Construction and Architectural Record and recognize the most effective ads in the building and design marketplace and the companies and agencies that produce them. 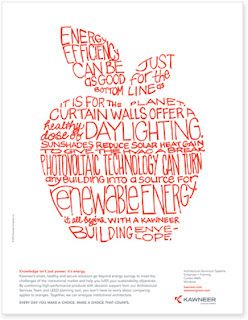 The winning advertisement features clean lines and a minimalist design with the image of a red apple “built” from language and information about environmentally friendly building products. The ad, developed to augment Kawneer’s “Every Day You Make a Choice. Make a Choice that Counts” message, demonstrates the company’s commitment to sustainable design and construction and to creating solutions that address the growing needs of the institutional market. Kawneer Company, Inc. is the leading manufacturer of architectural aluminum products and systems for commercial construction. Promotion for the competition stressed that information overload often decreases an advertisement’s effectiveness, so the graphic simplicity and diversely applicable message portrayed in Kawneer’s winning ad were both factors in it being chosen. Full page or larger ads published in Architectural Record in the first four months of 2010 were considered for the awards. Judged for their content and graphic presentation, winners were selected by a jury of eight architects and designers. Architectural Record recognized this year’s winners at the Excellence in Advertising Awards breakfast and panel discussion held Friday, June 11. Winners were selected from a nomination pool of over 150 advertisements and chosen based on content and graphic presentation as well insight into the architecture community.